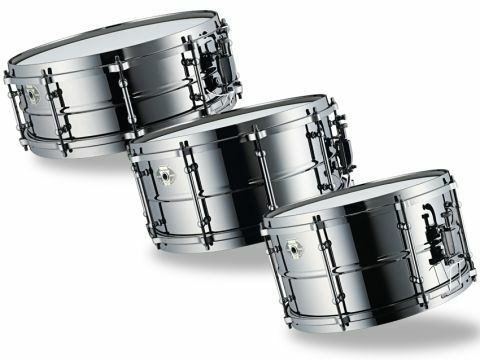 Black Beauty snares are in such demand that there is a permanent five- to six-month waiting list for them. Given that they are made exclusively in the USA, when available they also carry premium price tags. While not being exactly cheap, Black Magic snares make a fine, more affordable alternative - particularly for aggressive contemporary players. Unmistakably Ludwig in appearance. Rich, metallic and steeped with brass's characteristic warmth. Being Taiwanese-manufactured the drums are well made and the sheer amount of metal present gives them a reassuringly solid feel. Not quite a Black Beauty. Ludwig's Black Beauty snare drum is without doubt one of the greatest snares ever made. First introduced in 1919, it remains one of Ludwig's most iconic creations. Keen not to mess with the blueprint that has brought it such enduring success - yet at the same time eager to evolve the design to meet modern players' requirements - Ludwig has produced the new and separate range of Black Magic snare drums. Ludwig's concept is straightforward: take the essence of a Black Beauty snare and repackage it in a drum suited to today's hard-hitters. This is immediately noticeable in the choice of shell sizes, where regular 14"x5"and 14"x6.5" options are accompanied by a more contemporary 13"x7" model. Like Black Beauty drums, Black Magic snares are built around brass shells that are coated with a layer of black nickel. Black Beauty shells are spun from a single sheet of brass, with the end result being a seamless cylinder (spinning metal is an art that involves slowly stretching the sheet of material using special tools whilst it is rotating, in a manner similar to that of a potter creating a vase). Here the Black Magic snare's design diverges from that of the Black Beauty: the shell is still made from a single sheet of brass, but one that has been rolled into a shell and then joined with a vertical weld. Construction difference aside, Black Magic and Black Beauty shells are visually similar as they share a central horizontal strengthening bead. Once dressed with hardware they are easy to tell apart as Black Magic snares take the black theme to something approaching saturation point. Picking the drums up to mount them on a stand brings home how much metal has gone into each model. They are not only heavy but have a low centre of gravity. Rocking one back and forth whilst holding it by your fingertips quickly induces a pendulum-like motion. Brass shells usually make for lively-sounding drums and Black Magic snares stick faithfully to the script. These are bright, metallic drums that are alive with harmonics. The 14"x5" drum is the quickest of the bunch and gets straight to the point, reacting the instant the sticks make contact. Higher tunings are where it reaches maximum focus, snapping out short, sharp stabs of pure crunch. The extra inch-and-a-half in depth of the 14"x6.5" model makes quite a contrast, giving the drum a richer and more substantial voice. It's a commanding snare that could hold its own in just about any situation. Tuned just above the mid-range, its sound thickens to a delicious clonk that echoes countless classic rock drum sounds. With the heads tightened it still remains authoritative and only gets close to sounding choked at the upper extremes of tension. The 13"x7" drum manages to combine something of the whipcrack-quick response of the 14"x5" model with the clout of the 14"x6.5". It's a sweet-sounding drum - with a brass shell it's hard to sound anything but - but at the same time supremely belligerent. The two 14" drums would happily sit alongside an amp that goes up to 11 but neither of them can match the 13"x7" for sheer power. While it is a penetratingly loud drum, the quality of punch it delivers is just as impressive. The sharp-edged die-cast hoops bring their own energy to the drums, so cross-stickings bristle with harmonics while rimshots are akin to a gunshot at point blank range. Such levels of excitability mean that some form of dampening is required in close-miking situations. We found O-rings efficient but too stifling and settled on a single Moongel which nipped back the overtones while still allowing each drum's character to shine through.